The brachialis muscle is the primary flexor of the elbow. This muscle is located in the anterior compartment of the arm along with the Biceps brachii and coracobrachialis. Distal anterior aspect of the humerus, deep to the biceps brachii. Coronoid process and the ulnar tuberosity. 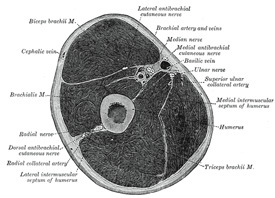 The brachialis muscle is innervated by the musculocutaneous nerve and components of the radial nerve. 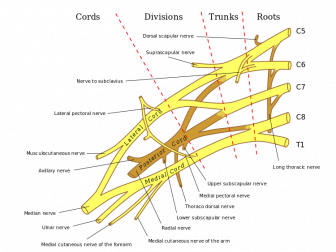 The radial nerve descends in the groove between the brachialis and brachioradialis muscles, above the elbow. Of the muscles in the anterior compartment, the biceps brachii and the brachialis are innervated by C5 and C6 nerve roots. Muscular branches of brachial artery, recurrent radial artery. The brachialis muscle has a large cross sectional area, providing it with more strength than the biceps brachii and the coracobrachialis. In order to isolate the brachialis muscle the forearm needs to be in pronation, due to the biceps brachii's function as a supinator and flexor. By pronating the forearm the biceps is put into a mechanical disadvantage. The brachialis muscle can be commonly injured by repetitive forceful contractions or muscular contractions with the arm in hyperextension. This is commonly seen in climbers, due to the pronation of the hand and the extended started position. Physical activity that involve a lot of pull ups, curls, and rope climbing can also initiate brachialis muscle pain. A strain to the brachialis tendon can also cause a patient to present with lacking elbow extension due to painful end-range stretching of the tendon. Due to the location of the pain, Medial Epicondylitis and lateral epicondylitis should also be evaluated. 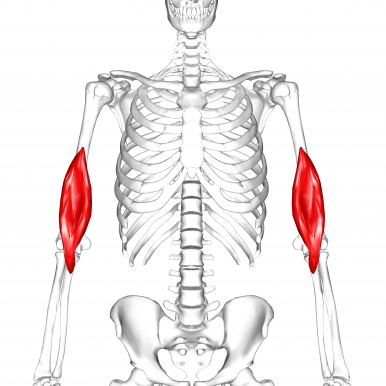 To assess the strength of the brachialis place the elbow at 90 degrees of flexion with the forearm fully pronated. Then have the patient resist an inferior force placed on the distal forearm. ↑ 4.0 4.1 Marieb EN, Hoehn K. Human anatomy & physiology. 10th ed. Boston, Ma: Pearson; 2016. ↑ Muscolino JE. Kinesiology: the skeletal system and muscle function. 2nd ed. St. Louis, MO: Mosby/Elsevier; 2011.